* Please allow 1-3cm differences due to manual measurement. * Due to the different display and different light, the pictures may not reflect actual color of the item. Please make sure you do not mind it before you ordering. 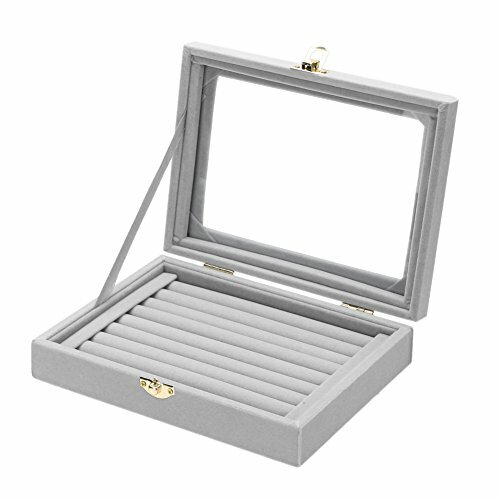  This Jewelry Display Case is constructed with sturdy composite board wrapped in premium velvet fabric with 8 individual compartments which gives it a stylish look and makes it stand out amongst the other jewelry boxes.  Unique Design- Features a clear glass lid that enables clear display of your stored jewelries while keeping them dust-free and anti-tarnish. Complete with a integrated safety lock for added security.  Size: Length: About 22.5cm/8.86"; Width: About 15cm/5.91"; Height: About 8cm/3.15"
 The elegant jewelry and accessory storage tray can be used to store earrings, necklaces, bracelets, rings, brooches, pins, watches, and more. It fits perfectly on top of your vanity table.  The jewelry display is great for personal use at home, and also for a countertop jewelry display in stores or trade shows.